Here is a common example of what once was a beautiful and costly pattern imprinted concrete driveway that had under several years/winters without having a single reseal, the colour has faded and the seal has worn away which leaves the concrete porous, allowing water and rain to soak into the the concrete of the driveway and then along comes winter and the water in the driveway freezes blowing holes and craters around the driveway due to the fact that water expands when it freezes in the PIC (pattern imprinted concrete). First off all we power clean the area using a high powered industrial diesel pressure washer generating 3000psi with a flow of 15 litres per min, not your average jet washer out the catalogue. 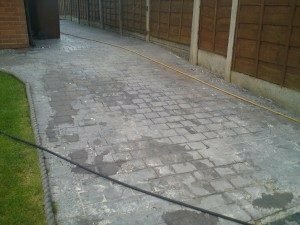 Such a piece of equipment is so powerful that it cannot be fed direct from domestic mains water supply… this kind of pressure washer is required to remove any remaining lose, cracked or crumbling concrete from the driveway so that we are left with a sound solid base to work with. 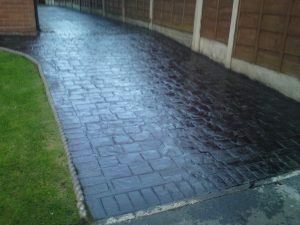 Next we use a specially formulated 2 pack epoxy resin, coloured to the nearest match of the driveway. we choose epoxy resin over a polymer concrete or a colour hardener for this task as it ables us to ‘feather out’ to an edge as little as 2mm- essential for fine detailed work, where as a polymer concrete or normal cement would lose strength and crumble under the weight of a car if it was any thinner than around 8mm left proud. The 2 pack epoxy we use has a tensile strength of about 40 newtons compared to concrete about 20 newtons. 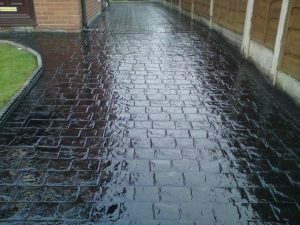 We mix the resins and apply to the areas with a trowel, or even gloved hand in some cases to compress to the base and to push inside intricate nooks and crannies of the driveway, we then use the exact stencil used to stamp the driveway to reprinted the epoxy, being extremely carefull to line up the pattern. We then leave the area to set and harden for at least 24 hours. We then return when the surface of the PIC driveway is dry and the the epoxy resins have set solid, in this case it was the next day, we first apply one coat of low solids sealer, with a solvent based (very important) colour pigment addative to recouor the full driveway and give a ‘keying’ 1st coat, allowing it to dry for approx 1 hour. Then we apply a 2nd coat, this time high solids, again with colour pigment to ‘mask’ the epoxy repairs and give a uni formal colour. Again around an hour to dry before applying the third and final coat, again with high solids, good quality acrylic sealer along with an anti slip additive to increase SRV’s (slip resistant values). 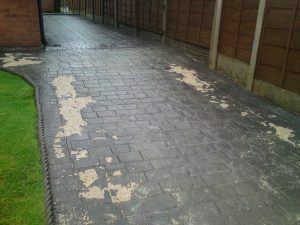 Look at the before and after pictures of the finished driveway, truely a transformation! 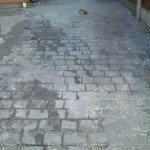 The only other option that the residents faced of repairing the pattern imprinted concrete driveway was for a PIC installer to come in, dig the whole section of the driveway up and relay approximately 20m2 of stamped concrete, they were quoted around €3000 to do so! We repaired, resealed and recoloured for a fraction of that price! Without the trauma and headache of heavy plant machinery as well!